I was always fascinated by the beauty of the late Princess Diana. She truly was a beauty! After reading a few books on her, I was convinced that the her marriage ended in divorce because of Camilla Parker, the current wife of prince Charles. Diana, being only 19 when she got married, was also believed to have been mistreated by The Queen herself. Last edited by sunnykode; May 8th, 2011 at 02:35 PM. Do you know what is the biggest contribution of Brittishers to the world????? It is the concept of Divorce. You know who was responsible for the divorce etc etc?? Mr. Hugivz Ashit. Seriously. End of story! Did they watch my wedding that I must watch their's ? Nobody is more royal than me in my self esteem. Last edited by zyzzva; April 27th, 2011 at 06:50 AM. Yes, I intend to watch the highlights. 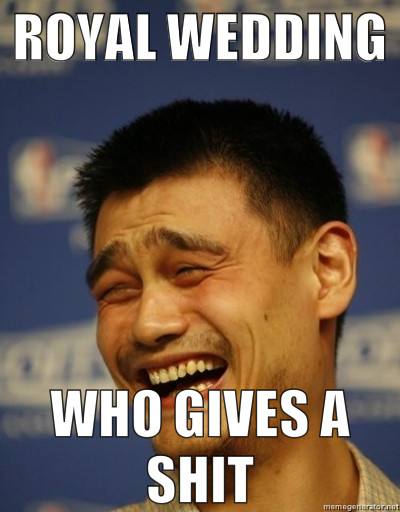 Not because my self esteem is low...but because to see how the so called "wedding-of-the-decade" actually looks like. Didnt I already say that?? That's only because Don Givafak was busy. That prolly happened when Katie was 15 and William still had some hair up there.. The most u gonna see/hear is William farting and going to sleep on his side aa the bed..